As with many inventions, several people had the idea for an integrated circuit at almost the same time. In 1950s many inventors realize, that despite of the fact, that transistors had become commonplace in everything from radios to phones to computers, and that transistors were smaller than vacuum tubes, for some of the newest electronics, they weren't small enough. There was a limit on how small you could make each transistor, since after it was made it had to be connected to wires and other electronics. The transistors were already at the limit of what steady hands and tiny tweezers could handle. So, scientists wanted to make a whole circuit—the transistors, the wires, everything else they needed—in a single blow. If they could create a miniature circuit in just one step, all the parts could be made much smaller. The first man, who must be credited for the conceptualisation of the integrated curcuit, is the British engineer Geoffrey Dummer (see yhe nearby photo). Geoffrey William Arnold Dummer (1909–2002) is a British electronics author and consultant, who passed the first radar trainers and became a pioneer of reliability engineering at the Telecommunications Research Establishment in Malvern in the 1940s. His work with colleagues at TRE led him to the belief that it would be possible to fabricate multiple circuit elements on and into a substance like silicon. 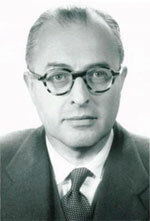 In 1952 he presented his work at a conference in Washington, DC, in which he states: “With the advent of the transistor and the work on semi-conductors generally, it now seems possible to envisage electronic equipment in a solid block with no connecting wires. The block may consist of layers of insulating, conducting, rectifying and amplifying materials, the electronic functions being connected directly by cutting out areas of the various layers”. This is now generally accepted as the first public description of an integrated circuit. At a later date Dummer said, “It seemed so logical to me; we had been working on smaller and smaller components, improving reliability as well as size reduction. I thought the only way we could ever attain our aim was in the form of a solid block. You then do away with all your contact problems, and you have a small circuit with high reliability. And that is why I went on with it. I shook the industry to the bone. I was trying to make them realise how important its invention would be for the future of microelectronics and the national economy”. 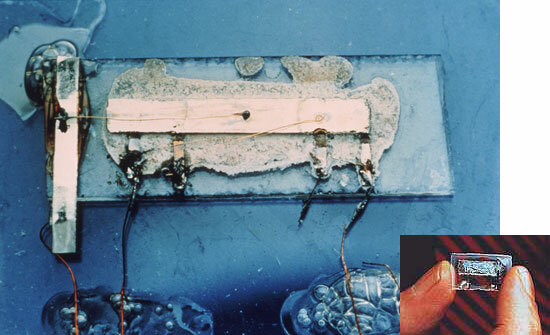 In September 1957, Dummer presented a model to illustrate the possibilities of solid-circuit techniques—a flip-flop in the form of a solid block of semiconductor material, suitably doped and shaped to form four transistors. Four resistors were represented by silicon bridges, and other resistors and capacitors were deposited in film form directly onto the silicon block with intervening insulating films. Dummer's ideas however remained unrealized and relatively unknown, because the UK military failed to perceive any operational requirements for ICs, and UK companies were unwilling to invest their own money. Dummer later said: “I have attributed it to war-weariness in one of my books, but that is perhaps an excuse. The plain fact is that nobody would take the risk. The Ministry wouldn’t place a contract because they hadn’t an application. The applications people wouldn’t say we want it, because they had no experience with it. It was a chicken-and-egg situation. The Americans took financial gambles, whereas this was very slow in this country”. And the Americans were again faster and took financial gambles. One day in late July of 1958, the engineer Jack Kilby (see biography of Jack Kilby) was sitting alone at a small, but innovative company in Dallas, Texas—Texas Instruments. In 1954 the company had been involved with manufacturing the first transistor pocket radio, which was enormously successful. Executives at Texas Instruments believed that the possibilities of electronic circuits were nearly endless. In May of 1954 company engineers perfected a process for making transistors out of silicon—an improvement which made them much less prone to fail when they got hot. In their research they discovered that several electrical components could be built from silicon, although at the time they were only interested in transistors. Kilby had been hired only a month earlier and so he wasn't able to take vacation time when practically everyone else did. The halls were deserted, and he had lots of time to think. As he remembered later: "As a new employee, I had no vacation time coming and was left alone to ponder the results of an IF amplifier exercise. The cost analysis gave me my first insight into the cost structure of a semiconductor house." It suddenly occurred to him that all parts of a circuit, not just the transistor, could be made out of silicon. At the time, nobody was making capacitors or resistors out of semiconductors. If it could be done then the entire circuit could be built out of a single crystal—making it smaller and much easier to produce. Kilby's solution to this problem has come to be called the monolithic idea. He listed all the electrical components that could be built from silicon: transistors, diodes, resistors and capacitors. What was the reaction of his colleagues? Kilby recalled: There were a number of objections. Most people thought that you would never be able to make them in quantity. 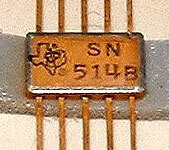 At that time less than 10 percent of the transistors at the end of the line were likely to be good. The thought that you would put several on a chip seemed like madness. Kilby then conceived the idea of constructing a single device with all the needed parts that could be made of silicon and soldering it to a circuit board. He understood that if he could eliminate the wires between the parts, he could squeeze more parts into a smaller space, thus solving the obstacle of manufacturing complex transistor circuits. When he presented this smash idea to his boss, he liked it, and told him to get to work. By September 12, Kilby had built a working model (see the lower photo), and on February 6th, Texas Instruments filed a patent. Their first Solid Circuit the size of a pencil point (11-by-1.5-millimetres in size ), was shown off for the first time in March, 1960. But over in California, another man had similar ideas. In January of 1959, Robert Noyce (see his biography) was working at a small startup company—Fairchild Semiconductor, which he and 7 of his colleagues established in 1957, leaving Shockley Semiconductor. He also realized a whole circuit could be made on a single chip. While Kilby had hammered out the details of making individual components, Noyce thought of a much better way to connect the parts. That spring, Fairchild began a push to build what they called "unitary circuits" and they also applied for a patent on the idea. Knowing that TI had already filed a patent on something similar, Fairchild wrote out a highly detailed application, hoping that it wouldn't infringe on TI's similar device. All that detail paid off. On April 25, 1961, the patent office awarded the first patent for an integrated circuit to Robert Noyce (see the U.S. patent 2981877 patent of Noyce) while Kilby's application, filed 5 months yearlier than Noyce's, was still being analyzed and the patent was granted as late as June, 1964 (see the U.S. patent 3138743 patent of Kilby). Today, both men are acknowledged as having independently conceived of the idea, but the real acknoledgement came too late, in 2000, when only Kilby became a Nobel Prize laureate for his invention of the integrated circuit, while Noyce died in 1990 and didn't manage to be honored with this prestigious award. The companies Fairchild Electronics and Texas Instruments had a court fight, that was not settled until 1966, by which time integrated circuit chips had become a multi-billion dollar industry. In the summer of 1966 executives of the two companies had made an agreement to share ownership by granting production licenses to each other. Any other company that wanted to produce integrated circuits had to pay both Texas Instruments and Fairchild. As for Kilby, the scientific community informally agreed that both he and Noyce had invented the chip and that they both deserved credit. Kilby and Texas Instruments had made a big breakthrough. But while the U.S. Air Force showed some interest in TI's integrated circuit, industry reacted skeptically. Indeed the IC and its relative merits "provided much of the entertainment at major technical meetings over the next few years," as Kilby wrote later. Since TI and Fairchild were the co-inventors of the IC, one might expect that they would release the first commercial devices, and in fact this was so. In March, 1960, Texas Instruments announced the introduction of the earliest product line of integrated logic circuits. TI's trade name is Solid Circuits for this line. This family, called the series 51, utilized the modified DCTL circuit and the SN510 and SN514, were the first integrated circuits to orbit the Earth, aboard the IMP satellite, launched by the US on November 27, 1963 (see the nearby photo). Fairchild's prototype chips were announced in November 1960, and the company had introduced its first commercial integrated circuit, the same device as Dummer's a decade ago, a flip-flop (the basic storage element in computer logic), at an industry convention in New York in March 1961. Soon other firms began to develop ICs, i.e. 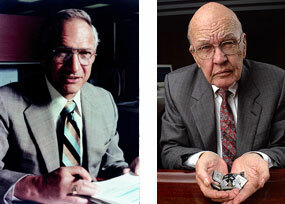 Motorola and Signetics, which announced their first chips in 1962. The integrated circuit first won a place in the military market through programs such as the first computer using silicon chips for the Air Force in 1961 and the Minuteman Missile in 1962. Recognizing the need for a "demonstration product" to speed widespread use of the IC, Patrick Haggerty, former TI chairman, challenged Kilby to design a calculator as powerful as the large, electro-mechanical desktop models of the day, but small enough to fit in a coat pocket. In 1965, Kilby was put in charge of directing a team to develop the world's first pocket calculator, made feasible by the microchip. Within a year Kilby and his colleagues Merryman, and Van Tassel had a working prototype, and a year later they filed for a patent. 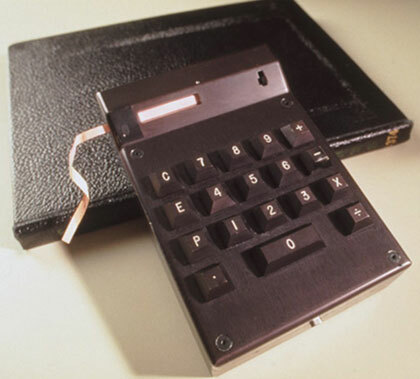 The resulting first in the world electronic hand-held calculator (see the lower photo), of which Kilby is a co-inventor, successfully commercialized the integrated circuit in 1967. The so called Pocketronic was launched on April 14 1971, weighed a little over 1 kg, cost $150, and could only perform the four main arithmetical functions. Displaying the output remained a problem. Light-emitting diode LED (light-emitting diode) technology, which became the standard for calculator display, was not yet advanced enough to use. So Kilby invented a new thermal printer with a low-power printing head, that pressed the paper readout against a heated digit.